It has become a norm these days for Ghanaian pastors to organize watch-night services every 31st December to usher believers into the approaching year. Such ones stay awake all night long praying from 31st December to 1st January. This, they term as Crossover because to them, they’ve successfully crossed over from one year to another. 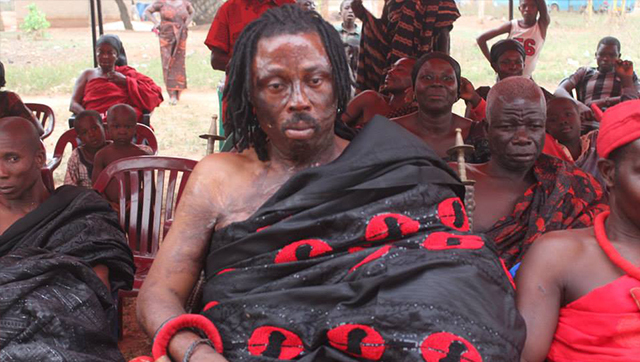 In view of that, renowned Ghanaian fetish priest – Nana Kwaku Bonsam – has also decided to organize what he term as ‘Flyover Night’ for all witches and wizards in Ghana. According to him, this will enable his countless dwarfs, Kofi o Kofi, and all witches in the country to gather at one strategic place and fly over from 2015 to 2016 with one accord. This, he said, will foster unity among the numerous witches and wizards in the country. Speaking to ScrewLife.Com, the celebrity agent of Satan in Ghana said the time has come for them (those who operate in the spiritual realm) to imitate some aspects of Christianity. Starting from January 1, 2016, Kwaku Bonsam said they will also start preaching the word of god in order to win more souls for the devil. He further stated that the Flyover Service is just a tip of the iceberg of what they have in stock for the year 2016. “Witches and Wizards in Ghana do not have any organized association yet. I’m planning to establish one where we can gather and worship in unity. A journey of a thousand mile begins with a step that’s why I came up with this Flyover Service idea to serve as the stepping stone for the many activities we will be having in the subsequent years,” Bonsam declared.